Did you know current research by researchers at the U.S. National Cancer Institute has shown that participation in regular exercise after 40 may raise life expectancy by up to 7 years? That regular exercise could be as something as simple as a brisk walk. In addition to living longer regular exercise may also lower risk for memory problems. I run a small group exercise class in Farnham Park every Friday morning for the over 50s. We combine a brisk walk with resistance exercises using dynabands or body weight. This is a class for all levels of fitness – each exercise will have an adaptation for you. So if you fancy living longer and being physically and mentally fit to enjoy those extra years why don't you come along and join us. If you have any questions then please call Helen on 07785747669. Posted in General, News, Resistance Training and tagged Fitness, group exercise, healthy aging, over50s on November 8, 2012 by Helen-WholeLifeFitness. "Age UK in conjunction with Bannatynes, David Lloyd Leisure Ltd, LA fitness and Nuffield Health Fitness and Wellbeing Centre’s (including Greens Health and Fitness) present Age UK’s Gym Open Day on 10 July 2012. Posted in General, News and tagged age uk, exercise over 50s, Fitness, health on July 2, 2012 by Helen-WholeLifeFitness. Posted in Exercises, General and tagged ageing, arthritis, Fitness, health, knee, personal trainer, personal training on April 19, 2012 by Helen-WholeLifeFitness. Posted in General and tagged Exercises, Farnham, Fitness, health, health tips, Self Care on November 14, 2011 by Helen-WholeLifeFitness. Posted in Exercises and tagged ageing, Fitness, health, walking on November 8, 2011 by Helen-WholeLifeFitness. Time to discuss stretching, which is often overlooked in exercise sessions. Yet it's a very important aspect of fitness, as a good range of movement is needed for many everyday tasks such as tying shoelaces, gardening or reaching for something on a shelf. I may have bent the truth a little in the title. The stretching itself should not take more than 5 minutes, however to stretch your muscles they need to be warm and therefore take 5 minutes just to warm up the body. This could be a walk around the garden or a couple of times up and down the stairs. Stretching shouldn’t hurt – stop at the point of tension and avoid bouncing or jarring movements. Inhale deeply as you begin a stretch, and exhale fully as you move deeper into the stretch. Hold each stretch for 15 seconds. Bend knee, grab the front of the ankle and pull the foot towards the bottom until a stretch is felt in the front of the thigh. Hold for 15 seconds, release and change legs. Place hands on hips and take a small step forward keeping the front leg straight and slightly bending the rear knee. Lean forwards from the waist, keeping the back straight. Take a step backwards – the front knee should be directly in line with the ankle. With hands on your hips lean your body forward slightly, keeping back foot on floor. Bend your front knee and ensure your back leg is slightly bent. Keep your front foot on the floor and your back heel off, make sure your feet are facing forward and slightly apart. Place your hands on your hips just above the bottom with palms facing the body and move the elbows backwards until a mild stretch is felt. Make a round back and push your hands away from you, lowering the chin slightly. 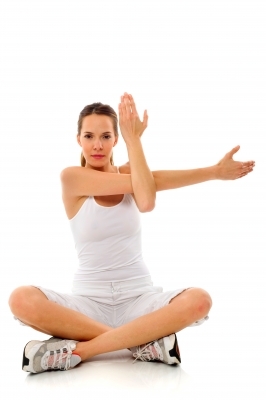 Clasp your hands together in front of you with palms facing the body, do not interlock the fingers. Reach upwards and, bringing your arms together slowly straighten your arms directly above the head without locking them out. Pull the left elbow in as far as you can so that your left fingertips can reach around your right shoulder. Hold for 15 seconds, release and change arms. Flexibility is a “use it or lose it” skill and you can always improve your range of motion and increase your flexibility . It is recommended that you stretch at minimum twice a week but an active individual could include some stretching everyday. Image courtesy of Ambro / FreeDigitalPhotos.net". Posted in Exercises and tagged exercise, Farnham, Fitness, health, over50s, seniors, stretching on October 26, 2011 by Helen-WholeLifeFitness.